As opposition to the Trans Pecos Pipeline brews in the Big Bend, the company behind the project – Dallas-baesd Energy Transfer – is gearing up for construction. Energy Transfer has said previously it plans to begin construction on the 143-mile natural gas pipeline by early 2016. Now, the Texas Department of Transportation (TxDOT) says rail shipments of pipe for the project will soon be coming to the Fort Stockton area. Elizabeth Grindstaff, the railroad’s Vice President of Sales and Marketing, confirmed the railroad is hauling the shipments for Energy Transfer, for the company’s planned natural gas pipeline connecting the Permian Basin to Presidio, TX. Lisa Dillinger, a spokesperson for Energy Transfer, said the shipments are expected to begin within the next two weeks. The loads will be moved by the San Angelo-based Texas-Pacífico Railroad on mile-long trains through Fort Stockton about four times a week, headed for an unloading site near Belding, TX. In an email, Grindstaff said the unloading site is about 11 miles southwest of Fort Stockton off Old Alpine Highway (Highway 194) in Pecos County. From there, TxDOT says the pipe loads will be trucked up to a staging yard along I-10. The rail shipments are expected to continue for about a year. 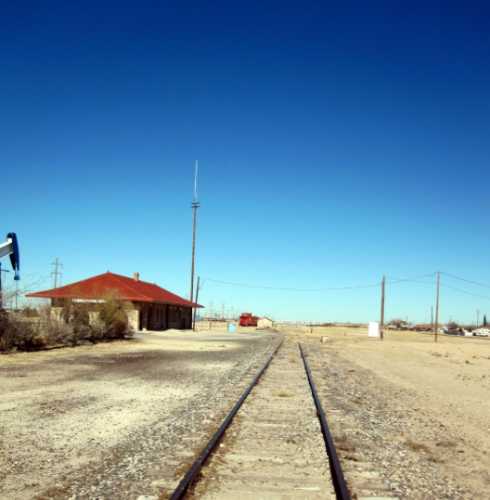 Rail shipments had before this point not traveled farther into town than the Fort Stockton Rail Yard. Powell said TxDOT doesn’t have an exact schedule for when the shipments will move through town. But he suspects it will be a minor inconvenience for drivers at railroad crossings. This entry was posted in KRTS News and tagged Fort Stockton, Natural Gas, Oil and Gas Industry, Pecos County, Railroads, Texas-Pacifico Railroad, Trans Pecos Pipeline. Energy Transfer. Bookmark the permalink.